My mother is not so mobile and requires mobility aids like a wheelchair and walker in order to move around. I remembered how panicky I was last year when I had to rush around to search for these and buy the best items for her. The shop I would like to recommend is Maycare (Malaysian Healthcare Sdn Bhd 218267-K) that mainly supplies medical equipment to hospitals. They also have retail stores for customers who need to buy these items. I wanted to write this article to help those who may need to find a reliable place where they could receive good advise to purchase mobility items. When our parents or loved ones get injured from falls or accidents, often we are ill equipped to know what are the best type of items to suit them based on their situation. I have gone through the situation and know that it is not easy to make buying decision. Recently one of my friend’s mother unfortunately had a fall (there was water leakage and it basically overflowed into the living room. Her mom came down from the stairs after a nap and did not know that the floor was covered with water. She stepped, skidded and had a fall. She broke her left upper femur bone). We went to Maycare shop and Shah Alam- most of their store staff are actually qualified physiotherapists and provided good advise to help my friend in the buying decision. No hard sell or trying to sell them the most expensive range. And I find that Maycare contains a wider variety of items compared to other retail medical supply stores because they are one of the largest. 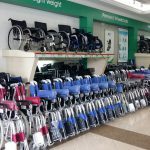 The range covers from speciality beds, mattress, exercise rehabilitation equipment, mobility equipments (wheelchair, walker, walking cane), paediatric (children) mobility to everyday items like masks, disinfectants, gloves, etc. 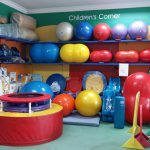 Above: Rehabilitation equipment for physiotherapy or exercise like stabilty balls and rebounders. Should you purchase mobility items like wheelchairs online? Wheelchair, walkers and walking sticks are widely available for online purchase. In fact, there are a lot selling in Lazada and the prices are pretty competitive. In fact, you would most probably be able to find cheap wheelchairs online. However, the downside of the wheelchairs or any mobility items that you buy online is the warranty and spare part. Equipments sold by medical supply companies like Maycare usually comes with warranty. And you would be able to get a spare part….. for example if a wheel breaks after a few years, there would be a spare part for that. 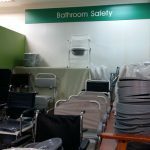 Also Maycare staff Mr Tan have informed me that as they mainly supply to hospital, the items such as beds and wheelchairs must meet the certification standards. Whereas if you buy an item online, you would not be really sure of the quality. If there is a manufacturing defect, usually there is no warranty. And there would be hard to get a spare part. It is the same as buying an electrical item- aside from possible dishonest sellers, there is the definitely warranty issue. I have been told that manufacturers do not guarantee such online companies so most of the time, the seller would have bought the item much earlier. It means your warranty period would not be full and complete. 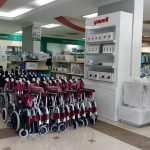 Finally, personally when it comes to getting a mobility product like a wheelchair, commode, walking frame and quad walking stick (which I got for my mom last year), I always want see the items personally before buying. The look and feel often DIFFERS between what you see in the professionally taken photos than in real life when you try it yourself. I am not knowledgable when it comes to these items and find the sales person would be able to give me good advise. If our loved one is going to use it, we would want the item to be sturdy, comfortable and does not rust easily. Granted, you need to know that such stores do not sell these items at pasar borong price because these are speciality items….on and off there may be sales or special offers so you may want to ask. Sometimes, people also buy directly from pharmacies …. however I find their choices to be very limited and may not be the quality that I want. For example, my friend had originally wanted to buy a commode from her regular pharmacy. The price is lower than what a specialty store is selling. Upon checking the item, I noticed that the commode is not so sturdy and is made of metal with no back rest. 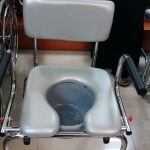 Whereas the commode my mom is using is more sturdy (she could use as a stable support to get up), made of lightweight metal with chrome finishing, foldable and does not rust (a commode also acts as bathing chair hence if it is just made of steel, it would rust easily). And it cost only RM50 more expensive than the one in the pharmacy. My mom is using it daily and on long term basis therefore it is really worth the price I am paying for. They have a large variety of items. For example many types of wheelchairs, push chair, motorized chair and transfer chair. For bathroom commode also they had a few types, depending on the need and usage. For example, above commode is cushioned with a back rest, hence more comfortable for the user. The commode height is also adjustable (but the chair is not foldable though). The side handles can be moved up or down. For below, the commode is a little wider as it contain a place where the person can use to place personal belonging items or to allow them to move on their own to transfer to a wheelchair, etc. 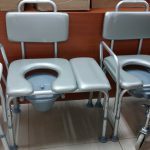 Both commodes also act as a bathing chair. When I went into the store, all the three staffs including the store manager are trained physiotherapist. The store manager informed me that if we are not able to bring the person along, provide at least a photograph of the extend of the injury so that they could best recommend the type of item suited to the person. Maybe because we are so used to stepping into a shop and the sales person do nothing but try to sell us as many items, and often in the most expensive range. But gladly I do not notice such trends when I visit Maycare. They may ask for your budget because there are products with different range and they need to know the range you can afford. I am not sure about their other stores but I know their Shah Alam retail showroom opens from Monday to Sundays. If not mistaken it is opened till 5pm on Sundays. I will list the store details down below…. you may want to call before going over. I went with my mom who was on a wheelchair. I was glad that instead of a step up in most sidewalks, they actually have a little slope where I could push my mom’s wheelchair up. They also have 2 parking bays right in front of their store for customers. I list this one because nowadays, I hardly dare to take my mom to along to any shoplots because her wheelchair would not be able to get up the steps so the fact that Maycare made the entrance as a slope really helps. You may view the full listing of their branch address, telephone and operating hours here.